Soil-less Gardens, Part 1: Introduction - Perelandra Ltd.
Soil-less Gardens: A completely new approach to your projects and goals. Many of you have started down this road with your co-creative gardens (some just this year with our One Bite Garden Series! ), and now you want to apply what you're learning to other aspects of your life. Some folks may not see the appeal of gardening, even with nature as your partner. Maybe you don't have a green thumb or you live in a city apartment, so you think all of this "gardening" information doesn't apply to you. It does. Machaelle Wright began her research with nature through a simple vegetable garden. She quickly learned that nature's definition of a garden is broader than we humans would imagine. It doesn't have to be growing in soil. A "garden" is actually any environment that's initiated and given its purpose by humans, and maintained with the help of humans. That changes things! Cooking, a restaurant, artwork, a museum or a memorial, design, construction, racing, an event, mechanics, business management, cleaning, governing, repairing, recycling, manufacturing, engineering . . . each of these things is a garden — a garden that isn't growing in soil. We call it a "soil-less garden" or "SLG" for short. And anyone can work in partnership with nature to establish, sustain and achieve success with a soil-less garden project. It doesn't have to be difficult or complex. If you've thought about trying a soil-less garden, watched the DVD, Working with Nature in Soil-less Gardens, or read the Perelandra Soil-less Garden Companion book, but you feel a little intimidated — relax. This "One Bite at a Time" series will help you blow right through your road blocks. To start a soil-less garden is to open yourself up to quite an adventure. Don't forget that your coning [team] members include nature and the White Brotherhood. There's not going to be anything "average" about your soil-less garden with team members like this. So if you're not up for an adventure, if you don't want to experience anything new or different, if you want to maintain complete control over your project, don't open a soil-less garden. If you do open one, remember to expect the unexpected. This will be your new "average." Are you ready for a new "average"? Good! Fantastic! Your first assignment is simple and easy. You might want some popcorn for #2. Want to learn a little more first? We are going to take this series slow, giving you one step at a time over the next several months. You may jump ahead if you like. But remember, slow and steady wins the race. Kudos! We encourage you to follow along with this series. We will be answering many of our most frequently asked questions along the way. Still not sure what we're talking about? We understand. For some folks, as soon as you hear the phrase "soil-less gardens" — without really knowing what the heck it is — it just strikes a chord in you. Like it's that missing piece to your puzzle. If that describes you, then we suggest you get started the easy way by purchasing the discounted Soil-less Garden Kit. 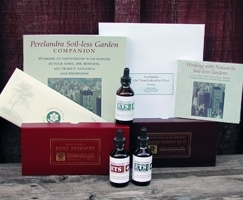 Once you get going with the process, you're quickly going to want to add the Rose Essences and Rose Essences II, as well as the Perelandra Nature Cards. Did we lose or confuse you? Give us a call any Wednesday from 10 AM to 8 PM, eastern. We'll be happy to help clear things up.